If you're looking for convenient fruit and veggie snack options, Crunchies® freeze-dried snacks are definitely worth checking out. These tasty freeze-dried non-GMO snacks are suitable for paleo, vegan, and gluten-free ways of eating, and they're also relatively low in carbohydrates and sugar. As someone who spends a lot of time traveling for work, I am always on the lookout for healthy treats that are easy to pack and transport. So, I was really excited when the Crunchies team provided me with a few free samples of their freeze-dried snacks to try for myself! I was pleasantly surprised to see how low in sugar these snacks are, as most other packaged fruit snacks I have seen have quite a bit of added sugar. That's not the case with these. Each flavor has 8 grams of net carbs per serving - and some have even less. That's because these sweet treats don't have any added sugar. That's right - none. Zero. They are fruit snacks that are, in fact, actual fruit and nothing else. 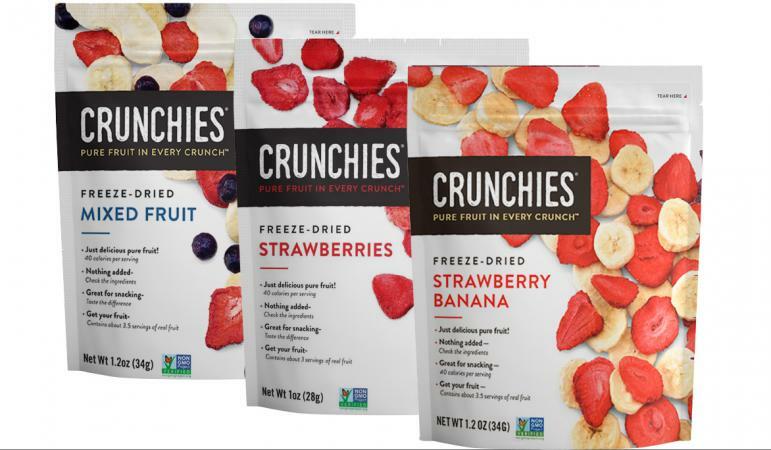 I tried several Crunchies flavors, and I have to say that the strawberries are my favorite variety. This isn't surprising, as strawberries are one of my favorite fresh fruits. Chances are that if you like a particular fresh fruit, you will like its corresponding Crunchies variety. The fruit flavors are great right out of the bag, and they are also a terrific topping for yogurt or your favorite smoothie recipe. They would probably also taste great sprinkled over cereal or oatmeal. 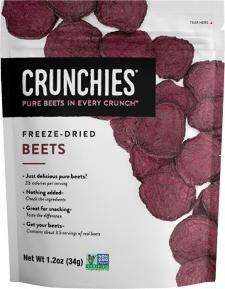 The beets also taste good, though they aren't something I would be likely to eat straight out of the bag. They are a good addition to green salad, though. Often when I am traveling for work, I will pick up pre-made supermarket salads for lunch. These beets are a great way to add a bit more flavor. I particularly like the fact that Crunchies are packaged in sturdy resealable bags. This makes it very easy to toss them in my briefcase or carry-on bag for on-the go snacking without having to worry about making a mess. Another terrific feature related to the packaging is the fact that the nutrition facts information on the back includes nutritional information for a single serving and the entire bag. Not that I would admit to eating the entire bag in one sitting - but it's good to have the information handy just in case! You can shop online if you'd like to have your favorite Crunchies flavors delivered to your door. The company even offers a convenient 'Crunchies Club' subscription option if you want to keep 'em coming while also saving 25% on each order! If you'd rather shop in person, simply enter your zip code on the Find Us page of their website to locate a retailer near you.